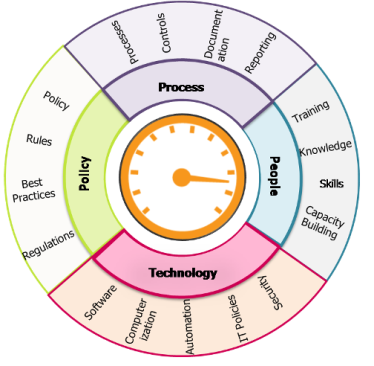 Policy dimension (the WHY of change management) – The governing Act, Rules, Policies, Guidelines which set the basic governing environment in which the organization functions. These policies need to be aligned to the regulatory environment on the one hand and the strategic goals set by the Management on the other. This dimension answers the question – Why something needs to be done? Process dimension (the WHAT of change management) – The process dimension addresses how policies are translated into specific actions on the ground. The challenge here is to put in place processes that ensure that the organization functions efficiently without compromising on necessary internal controls envisaged in the Policy documents. This dimension answers the question – What needs to be done and how? People dimension (the WHO of change management) – Policies and Processes mean little unless the organization has the human resources to implement the policies and run the processes. This dimension addresses the manpower requirements in terms of quantity and quality aspects and answers the question – Who will do what? Technology dimension (the HOW of change management) – In today’s business environment, process improvement is invariably linked to applying the appropriate technology tools for process automation. This dimension is closely linked with the Process dimension. This dimension answers the question – How will things happen?